If you request an ambulance in the cities of Glendale or Warson Woods, a fire truck will also respond automatically. 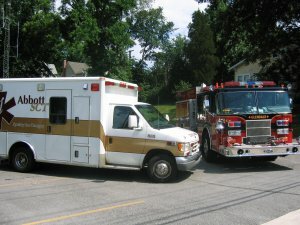 Glendale Fire has a contract with Abbott Ambulance for transporting patients to the hospital. Typically, a fire department unit can arrive on the scene prior to the ambulance. The fire department units are staffed with EMT’s and/or Paramedics who can begin treatment prior to the arrival of an ambulance. When responding to an emergency medical incident, time is of the essence. A lot of information is needed, and sometimes is either unavailable or is unable to be relayed. The following form was created by the Glendale Fire Department to make a medical incident less stressful. It can be filled out and kept on hand in event of an emergency. Click on the following link to open the document, print a copy for each person in your household, and fill in information. Keep this form somewhere easliy accessible, such as the side of your refrigerator. Also keep a copy with you when you are away from home. Forms are also available at the Firehouse. If you have a medical emergency away from home, there are other ways to help responders access vital medical information. Carry medical information in your wallet or purse. You could carry a copy of our form, or write the same information on a smaller card. Record an ICE (In Case of Emergency) number on your cell phone. Record the number of a trusted person who knows your medical details. But instead of recording that person’s name in your phone book list, use “ICE”.